Heat oven to 400°F. In food processor, place 1/2 cup bread crumbs, the walnuts, garlic, salt and pepper. Cover; process 30 seconds. Add cilantro; process until well blended. With food processor running, slowly add oil, stopping occasionally to scrape down sides of bowl, until pesto is spreadable. Spray 15x10-inch pan with cooking spray. Place salmon fillets, skin side down, in pan. Spoon about 1/4 cup of the pesto evenly over each fillet. In small bowl, mix Topping ingredients; sprinkle over pesto. Bake 12 to 18 minutes or until salmon flakes easily with fork and topping is light golden brown. 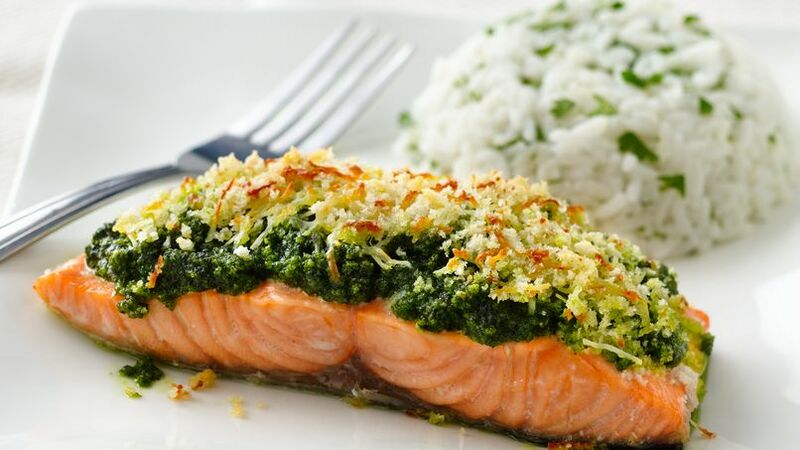 Progresso® bread crumbs provide simple addition to this salmon topped with pesto and cheese – a hearty dinner.